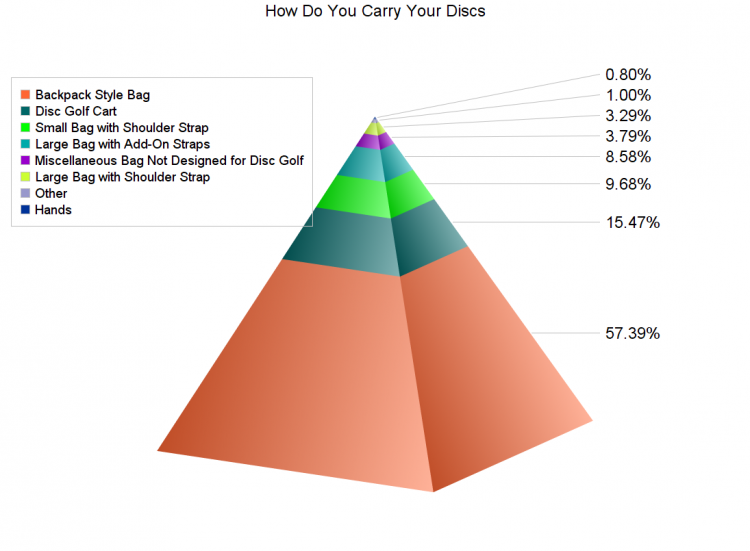 Disc sellers may like this tread toward backpacks. They are good for carrying all your beer and extra cloths but… I am one that feels a limit should be put on the number of discs a player can carry in a tournament. The limit should be 15. A player can replace discs between rounds. There is nothing worse than playing in a tournament and you have to deal with someone that takes forever to find a disc. Calling someone for time never works. Plus it is supposed to be a sport. If you need more than 15 discs to play you have a personal problem. With better plastic, discs rarely break so spare discs should be left behind. There are limits on equipment in every sport. Once again disc golf is not considered a sport by general public because of rules not being followed. Or the lack of rules and etiquette. Two of the worst players I ever played with are top level pros. They play out if turn. Stand in front of you when you try to putt. It is hard to grow the sport when disc golfers vandalize, toss garbage on course, and jump around like drunken lemurs when they play. Jump putters and step putters should not be exempt from foot fault rules. It’s cheating and it doesn’t follow any etiquette. Courses throughout Montana are closing because of these obstacles and the PDGA needs to listen instead of kowtowing to pros that cheat. Membership organizations rarely have a focused view and fail to progress because they cater to ignorant masses. Just the historical facts. But keep buying Innova TL’s so they keep making them. I want a back supply. 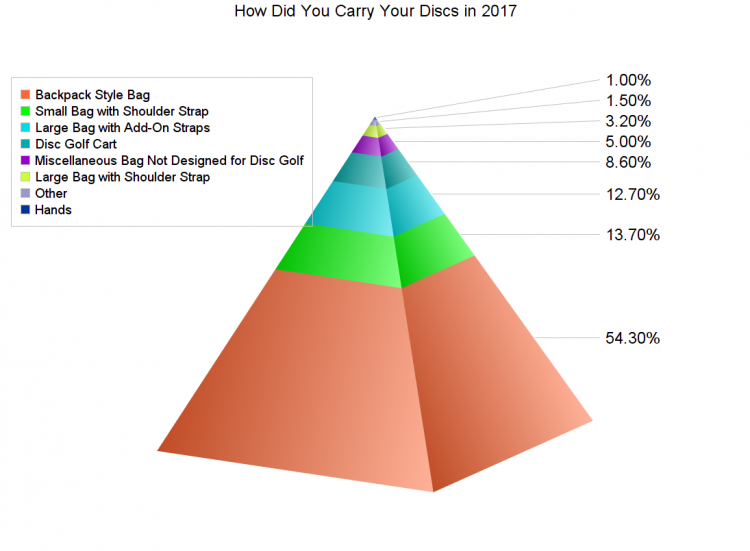 I have to disagree, top pros and Ams carry over 20 discs in their bags. I carry 27 discs on the course, it’s not fair to the other players that they can’t carry a disc for every situation. And in my years of watching and playing disc golf no one has EVER taken over 15 seconds to pick a disc. That is a non-issue. And your comment about jump putting is ridiculous, that’s what the circle is for. The “foot faults” you are talking about are only detectable by frame by frame on a video. Calling clear violations is reasonable, but you sound like a person who is standing with a stopwatch waiting to call someone on taking over 30 seconds, that is not how any sport should be played. I discovered Disc Golf last year in my home town. While passing the local park, I saw a bunch of young guys pushing around baby carriages. After learning that what I saw was a Disc Golf Tournament, I jumped into the sport. years of age and zippers on both knees, it got old quick, bending down to pick up this bag off the ground. So, I went into my barn and brought out my old golf push cart. 5 mid-ranges from my 5 drivers. My putter is strapped to the front with a small bungee. Everything is at waist high. I also crafted a perch where I bungee a UE speaker on the pull handle above the milk crate, so I can stream music when I play. It comes in around 17 lbs. with everything except the Gatorade and UE speaker. It’s easy to see that a cart is less work then lugging a bag around. You probably remain fresh, deeper into a round then toting a bag. No limits on discs ! You need backups for harder courses, water & OB’s. If your bags organized you can find any disc easily, no has to wait !